Having just awoken, I popped out onto the balcony with my morning coffee: cripes it was cold and accentuated by the ship racing along through a strong north westerly wind towards the Bay of Biscay, ooh err. Naturally, I came back in more than a bit quick. The morning update from the captain suggested that the weather would remain pretty much the same for the rest of day. Actually, that’s not so bad; the Oceana laughs at such weather so we knew we would be in for a comfortable day at sea. Yes that’s right, we have a sea day, when all we will be able to see is sea [again and again]. Yesterday we made our last stop 😦 before heading home to Southampton (boo). That last stop was Lisbon and I awoke just as we were heading up the Tagus (Lisbon’s equivalent to London’s Thames though the Tagus is much bigger) and just coming to pass the Torre de Belem or Belem Tower and the Monument to the Discoveries before passing under what must be noisiest bridge on the planet. As you pass under the bridge and look up, it would appear, to me at least, that the road consists of a metal grid so as the traffic drives over the grid there is a constant rumble from the tyres, magnified by the very bridge itself: a passenger plane flew directly overhead as it was coming into land at Lisbon Airport, yet the noise from the bridge drowned out the plane. But the best bit however was watching the funnel of the ship seemingly just fitting under the bridge as we made out way to our berth, or ships parking lot. On our first visit to Lisbon, the weather was extremely hot and most of the shops were shut so we weren’t that impressed. 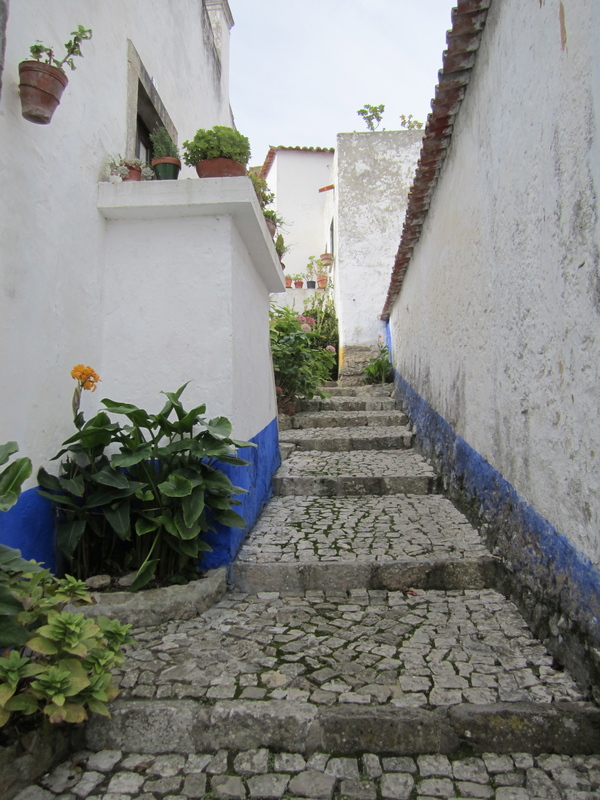 The second time, we took an excursion to a town called Sintra: a fairy tale town well worth a visit. This time, we decided to take an excursion to a little medieval town some 80 kilometres away called Obidos [one of the seven wonders of Portugal]. Interestingly, the tour literature in our cabin suggests: Sintra; Estoril,;Cascais and Queluz as places to visit but fails to mention Obidos. This is a shame as this quaint medieval town is a most fascinating place to visit. Built on the side of a hill (I know that because Mrs Me made me walk down many steep sloping cobbled streets, which did of course mean I had to come back up the buggers), the town reminds me of a quaint fishing village of Polperro but without the sea, boats or fish. As freezing as it was, the visit was well worth it. On a personal note, I still prefer Sintra, but Obidos is a good alternative. On the way back, our tour guide suggested that we visit the supermarket inside the railway station located directly opposite where the ship was parked! Why? because, by all accounts, you could get some really cheap wine of the region and would be ideal for Christmas. Well, Mrs Me wasn’t going to pass up on such a suggestion and off we went. I have to say that to find a supermarket inside a railway station, next to the railway line was rather weird but hey ho and in we went. Very briefly I thought Mrs Me was going to a ‘big shop’ as she started to check the price of such items as chocolate spread, jams, tea, coffee, etc. but fortunately she realised the folly and concentrated on wine, and chocolate Santa’s, and chocolate biscuits, and I know not what else but she was pleased and I knew that we had indeed done well. and so back to the Oceana we went to prepare for our now traditional British Sail Away. This is something we do on every last port of call and it’s absolutely fabulous. As we all crowded on the sun deck and promenade deck, every passenger is provided with a least one, often many, union jack flags to wave our final port farewell and sing traditional british songs such as We are Sailing, Rule Britannia, My Old Mans a Dustman, I’ll walk 500 Miles!, and of course, God Save the Queen, all at full volume just make sure that everybody knows the Brits have been, but are now leaving. Having sailed away, we retired to the Yacht & Compass for a fivesey or two (glass of Merlot @ five) before our Peninsular Club Party (for all their loyal cruisers) hosted by the Captain: another chance for Mrs Me to go all dreamy again. Of all the parties we’ve been to, this to be best one yet. For an Italian, the Captain has to be one of best we have had the pleasure to sail under (oh no, Mrs Me has gone even dreamier). This was also a time when he [The Captain] had the opportunity to reward random passengers via a prize draw. Needless to say, we weren’t a winner but the main winer was somebody who so deserved it having sailed with P&O since the 60’s with her husband but unfortunately now cruising alone. She gave a great insight to early day cruising where cabins had only a wash basin with other facilities being located in a central area. I think passengers were also expected to be in bed by a certain time. After dinner was the crew talent show and auction, in support of the Philippines relief fund. The final total for funds raised on the Oceana will be given towards the end of the cruise but we know the final amount will be significant. And then it was time for bed ready for a lazy day at sea tomorrow when we can start to think about packing (boo) but not actually doing so. I’m beginning to suspect that the presence of the Captain may need me to prise a dreamy Mrs Me away from the Oceana rather her getting off voluntarily. Clearly, a follow up cruise will be necessary. Meanwhile, I will once more venture onto the balcony to see the sea, nothing but the sea. The sea is all I will see. Lets Go See the Sea!